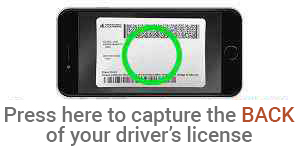 Take an image of the back of your US Driver's License to move a little faster. Want to do it yourself? Close the pop up window and proceed. Your Application is not complete until you read the disclosure below and click the "I Agree" button in order to submit your application. By clicking on 'I agree', you authorize us to verify the information you submitted and to obtain your credit reports. Upon your request, we will tell you if a credit report was obtained and give you the name and address of the credit reporting agency that provided the report. You warrant to us that the information you are submitting is true and correct. By submitting this application, you agree to allow us to receive the information contained in your application, as well as the status of your application. By clicking on the checkbox, I am confirming that I have read and understand the Security Agreement. Please provide new verbiage here: Online applications aren't for everyone. If you would prefer to work directly with a Loan Officer, please contact (855) 774-5626 or visit your local branch.